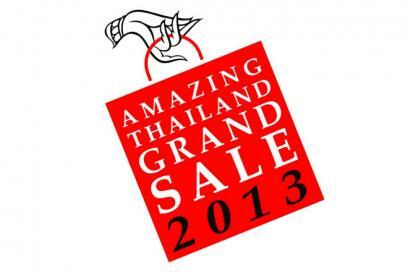 Amazing Thailand Grand Sale offers huge discounts of 10-80% on each and every product shown in showroom. Other than discounts their are some shop who provide free testing of food or clothes or holiday packages and many more. This event is celebrate throughout the Thailand's department stores, jewelry shops, shopping malls, King Power Duty Free, golf courses, Thai products, spa and massage, hospitals, as well as from the leading airlines and online travel agencies. Many Tourist Agencies are provide huge discount on travel packages of Bangkok, Chiangmai, Phuket, Hat Yai, Hua Hin, Pattaya, Koh Samui and other famous destinations in Thailand. This event is made to attracts many target tourists across the globe. 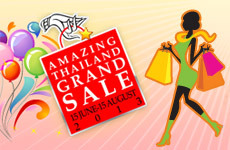 Many shopping Lovers are people comes to Thailand from Malaysia, Singapore, Vietnam, Hong Kong, Japan, South Korea etc. to travel and go shopping in the low season of Thailand. Traditionally, Thailand has been an agricultural economy, and the cultivation of rice using old methods continues even today. In recent times, an increasing number of tourists are showing more interest in exploring the unseen side of this country. With the rise of eco-tourism, travelers have started visiting some remote areas of the region. Thailand's history is characterized by a series of military coups that were largely peaceful. Today, the country has achieved a considerable amount of stability, thanks to its new prime minister. This has been of immense benefit to the growing tourism industry of this region, which attracts plenty of travelers every year coming from different corners of the world. Many of the country's towns and cities are favored by majority of travelers, but there are certain areas that remain rather unexplored. A very interesting aspect of Thailand tourism is the visit to farms that are created by building terraces to shore up the hillsides. People living in the hilly areas of the country pioneered this concept of farming, and thus adapted to their surrounding environment easily. Since the steep-sloping hillsides are the only option in terms of land to grow their crops on, terrace farming developed as an innovative way of cultivating rice in these areas. As a result, one can find many such farms in the remote parts of Thailand, and several tourists have taken this concept to their own countries. Rice crops have been cultivated using this method since ancient times, and farmers have created several levels of farms in this process. An area that seems very inhospitable is utilized by people inhabiting the region to grow their crops in this way. 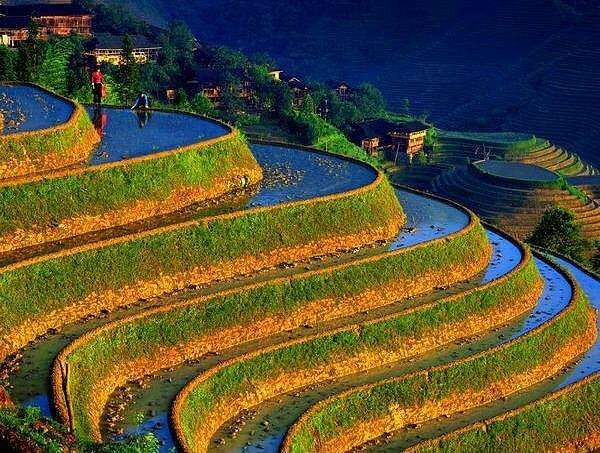 A Thailand rice terrace appears more like steps on a steep slope that is extremely beautiful to look at with its rice crops swaying to the tune of winds. Water stops on the level plain, instead of flowing down the hillside. This prevents erosion of lower terraces and higher ones get enough water. In this way, water is put to good use, which would have otherwise been wasted. 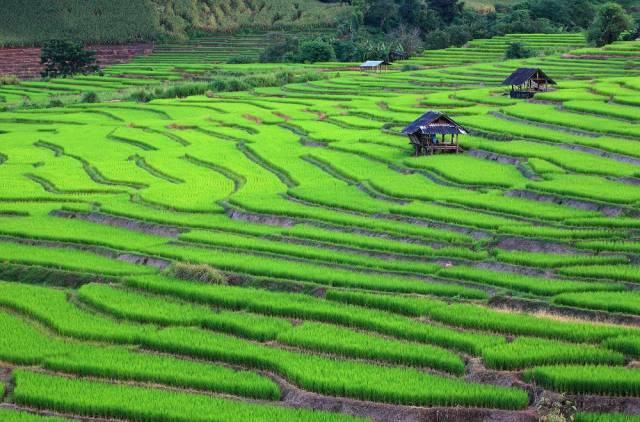 Vast quantities of rice which comes from Thailand are grown on such kind of terrace farms, a concept which has also been adopted by a few other Southeast Asian countries. Invention of this type of farming was made out of necessity, as people of these areas had no other way to get their food. 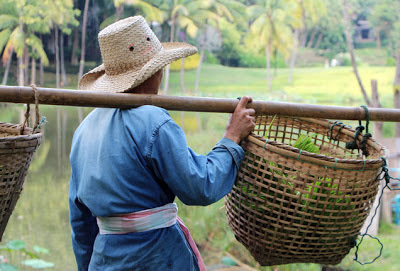 Thailand rice farmer carrying rice bundle. When rice has matured slightly it called as “Baby Rice” byThailand farmers, it is cut and moved to the mud in the flooded fields. Each grain in the bundle is then stuck upright in the mud. 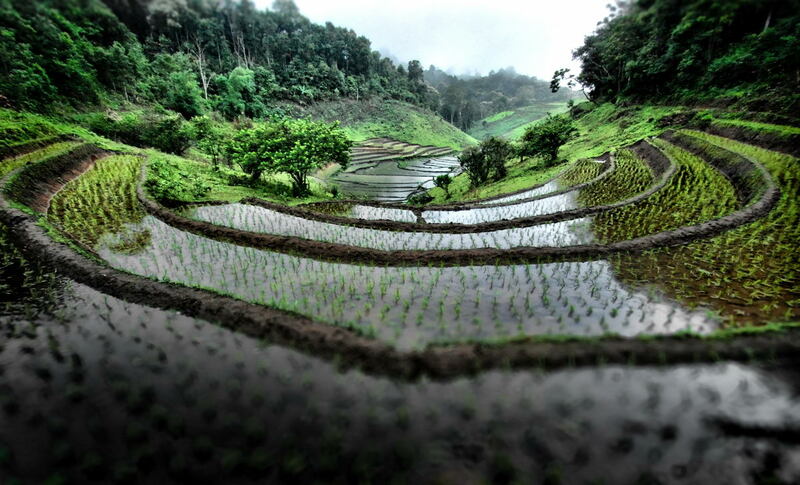 Rice requires plenty of water to grow, and terrace farming is the best way to ensure adequate supply of water to the farms. 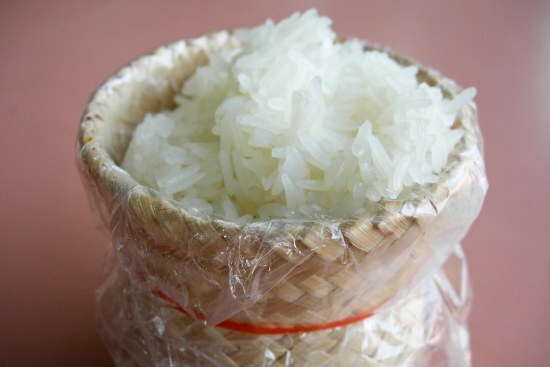 For promoting Rice Farming Thailand Government organizes “Thailand Rice Convention” each year. In recent times, many tour operators are coming up with innovative ways to attract tourists wanting to visit Thailand. 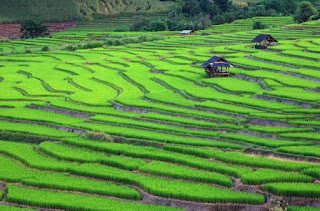 They include tours to the areas where travelers can witness rice terraces and know more about the method by which rice is grown in such a way. People who are a part of these tours would also get the unique opportunity to interact with local farmers. 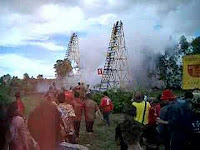 In this way, a rather unusual option has been added to the itinerary that is generally offered to the tourists. Every year, plenty of tour operators or travel companies come up with excellent vacation packages for people who wish to explore Thailand. Most of the exciting places to see in this country are included in these packages. On certain occasions, there are discounts or special offers that are provided for travelers, which help them to save big time while booking their tour packages. Booking of international flights, hotels and Thailand tour packages have been made easy today due to the presence of various travel websites. User-friendliness of such sites enables tourists to book their desired Thailand packages instantly without any hassles. 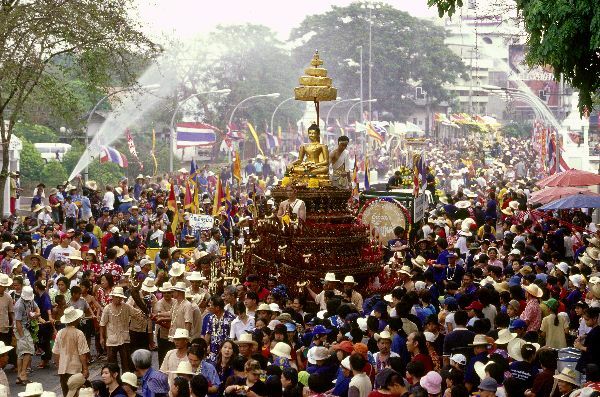 Thailand is a kingdom of festivals which is always busy in celebrations of various regional and global events. There are many reasons for the tourists to visit this marvel of Asia called Thailand. 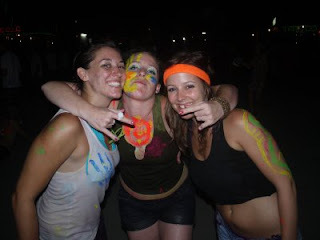 Some of the invigorating occasions are the various parties held at beaches like half moon party, full moon party , black moon party, Shiva moon party or Chiang Mai half moon party. 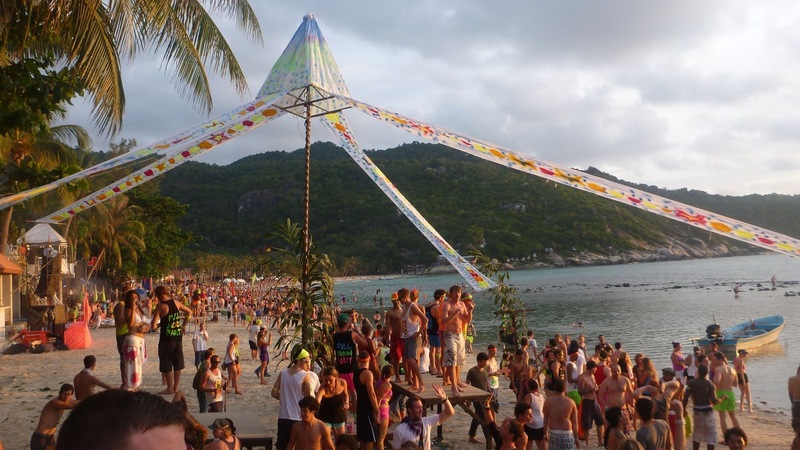 Celebrating various events throughout the year and partying at the exotic beaches on special occasions is much common in Thailand. 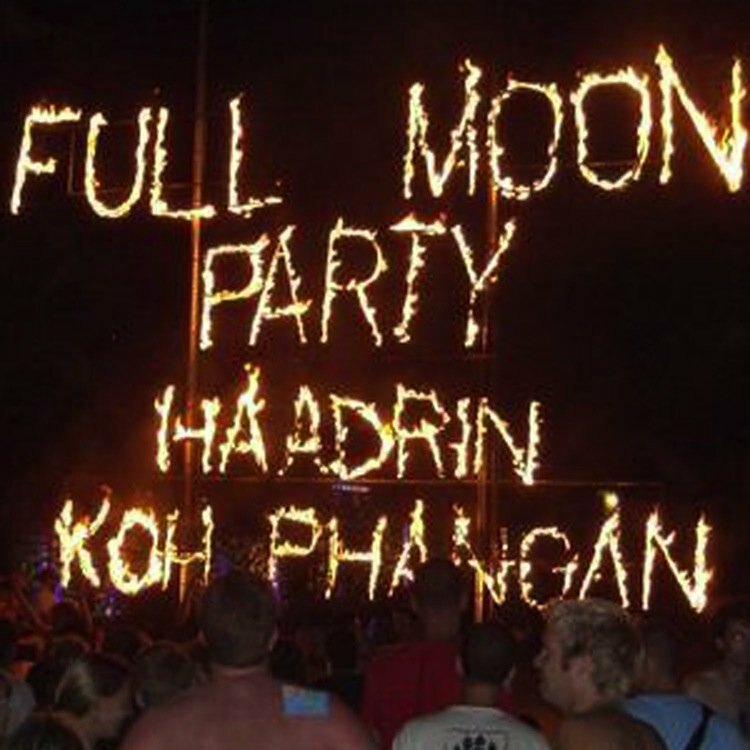 Among these parties full moon party in Thailand is the most popular party amidst international tourists, who gather at various locations in Koh Phangan Island in the month of June. They participate in a whole night feast of vibrant entertainment. If you are a party enthusiast then these occasions are a perfect match to enjoy at the background of the glittery moon and the roaring of sea waves. Thailand beaches are dazzling with illuminations and the blaze of the cheering crowds. As the sun goes down at the islands and the moon starts blooming in the skies, party celebrators start gathering at the white sandy beach. 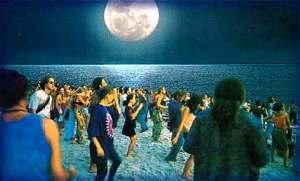 As the evening moves further the party starts picking a momentum and the beach turns into a dancing stage. 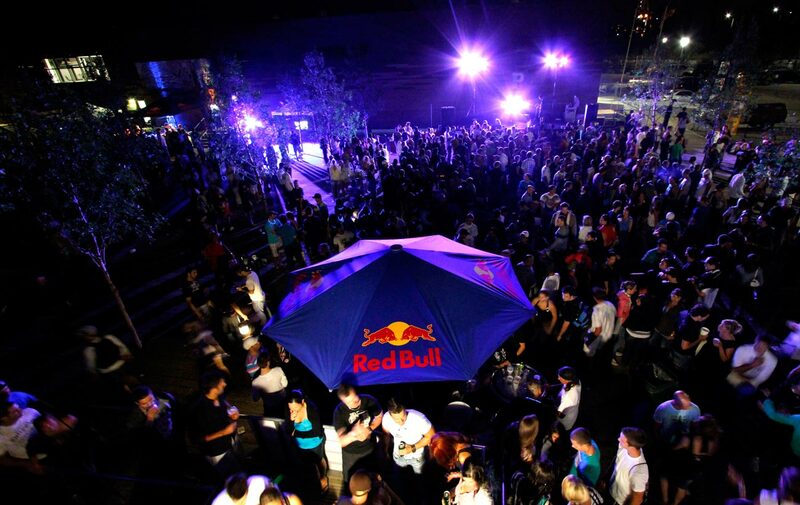 Everyone enters a trance of musical atmosphere where they can hear only the beats and bass of drums. Everyone is at liberty to choose the dance style he likes ranging from commercial dance to the recent reggae. The mob is entertained by fire eaters, jugglers and fire walkers, who present their explicit skills making the night more dazzling. With attractive display of fireworks the place becomes a floating paradise, under the bliss of the moon light making the waves shining like silver fish. 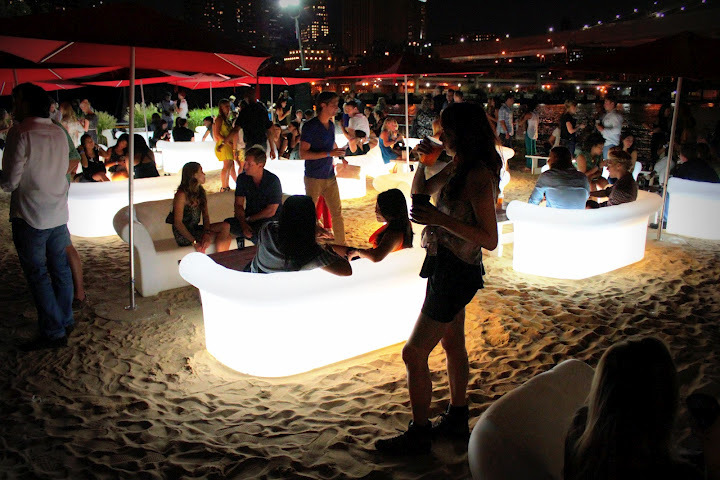 Vendors are at service providing drinks and bites of incredible sea food to the night owls. With the advancing night the party reaches a peak when the participants are totally immersed in the joy of music and dance. There are no limits to your enjoyment you just have to grab the thrill as much as you can. 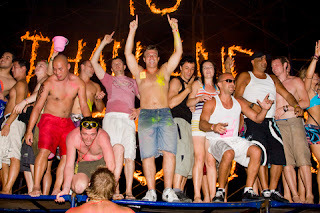 Thailand holidays invariably offer you a chance to join one of these exclusive parties. If you are excited by knowing about the fun involved in these beach parties then don’t just wait, reach the beaches of the islands for a full moon party 2013 in Thailand, celebration which is on 23rd of June. There are splendid condo rooms near the popular beaches of Thailand where you can stay for an easy access to the incredible beaches. 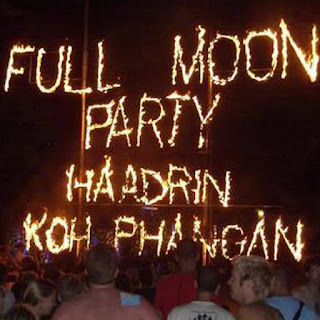 One of the best aspects about Thailand that tourists admire is its important festivals that are celebrated every year. There is a festival in this country somewhere every month, which is a source of great fun and excitement for both locals as well as travelers. Many of the tourists make sure that their visit coincides with one of the Thailand festivals and events that involve grand celebrations. Thailand has a rich cultural heritage which has been shaped by its Buddhist traditions that were always protected from colonial influences. It is a country where modernity blends well with tradition, something which is rarely seen in any other country. An economy that depended on agriculture to a great extent, witnessed a boom in industry and services sectors in the 1980s. This paved way for the emergence of a modern society, but frequent political instability continued to create hurdles. Finally, tourism industry gave a much-needed boost to the economy, attracting plenty of tourists from different parts of the globe. Today, there are many travelers who visit Thailand not just for its natural beauty, but also for its amazing culture which is witnessed during festivals. Many of them even get the chance to be a part of festivities held on such occasions. Thailand welcomes the New Year with a countdown at Central World Square located near Chidlom sky train station. New Year's Eve gives the chance for tourists and locals to have a great time with beer gardens, live music and lots of dancing. Many tourist visit Thailand from all over world to attain the New Year Eve and New Year Party. It is celebration going on all over Thailand. 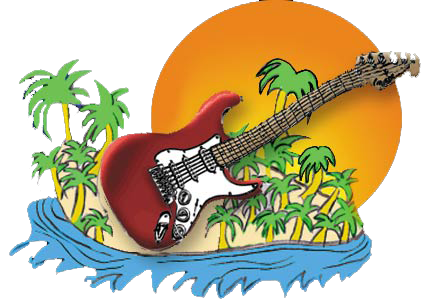 In February, rock music lovers can enjoy the Phuket International Blues Rock Festival that features 12-15 live blues bands from Thailand and other countries such as Australia and United States. Most of music lover come to Thailand to attain Blue Rock Festival at Phuket. Specially Blue music genre is played at all over the Phuket. 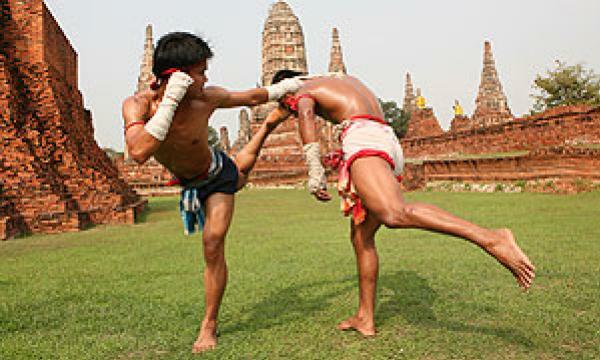 The main highlight in March is the World Thai Martial Arts Festival which is held by Muay Thai Federation. Other than the entertaining fights, what makes this festival interesting is the ceremony that goes into it. Many tournament is held on occasion of this. The tournament is distinguished by weight of players. You can experience some of the best fight during this season. 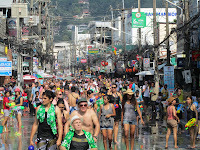 April is the month for enjoying Thailand tourism with Songkran Festival, which is quite unique and absolutely funny. Tourists visiting Thailand during this time of the year can have water poured on their heads or hose pipes turned on to them. They would be surprised to know that this is actually the Thai New Year and water is used to bless friends and family members. 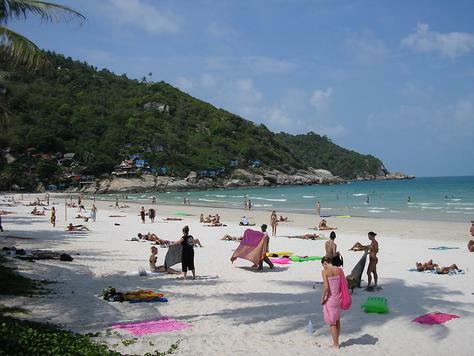 Most of the hotels and resorts in Thailand are booked well in advance at the time of major festivals. 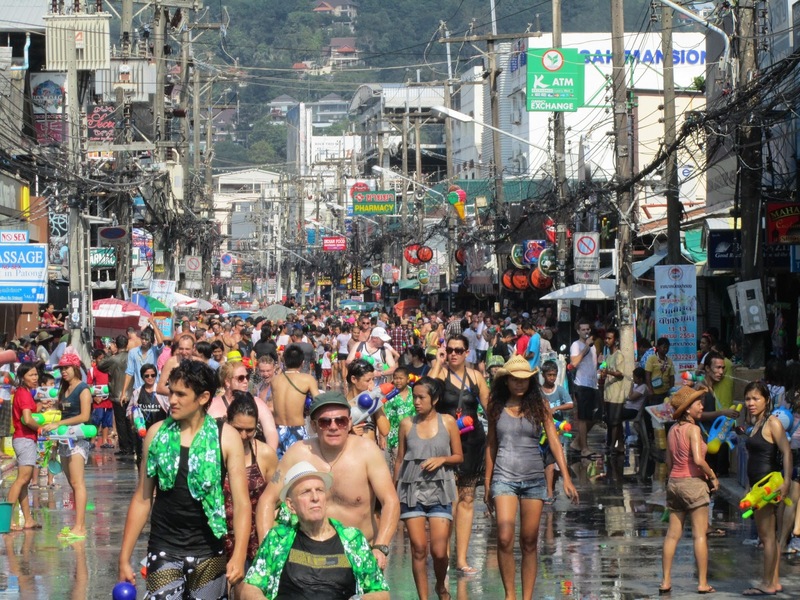 But the heavy rush on such occasions would not prevent tourists from enjoying the festivities, as they can rent a Thailand condo room at much lower rates. Parades and dances can often be seen from the window of these rooms. They are often well-equipped with all the basic facilities, along with certain added amenities for tourists to have a pleasant and memorable stay. A seaview condo can not only help travelers to enjoy the festivities held during the important festivals, but would also offer them unobstructed views of the beach nearby. Condominiums in Thailand are also located close to all the famous attractions of the country, which is of great convenience for tourists. They can also book condos that are near the major stations; making it easier for them to travel to different locations, especially during festive occasions.